Heat up a little oil in a large low sided pan until very hot - the point of smoking. 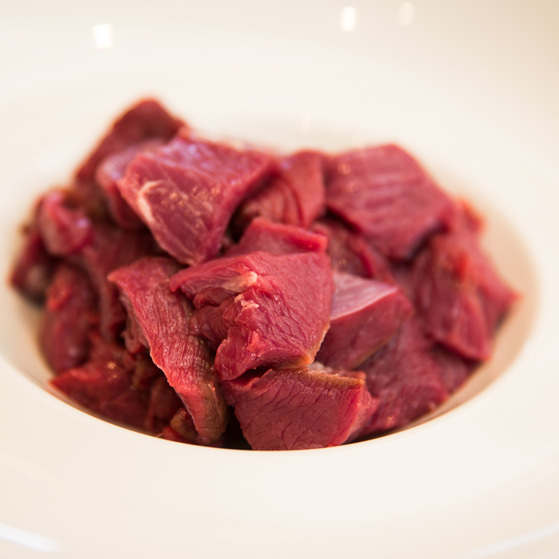 Take half the diced venison, season and dust in the flour then fry in the hot oil to seal and colour well. Once the meat is well coloured remove and add a little more oil and repeat with the rest of the venison. When all the venison is sealed, add a little more oil and turn the heat down, then add the onion and garlic allowing to cook without any colour and until soft. Meanwhile bring stock to boil and add the dried mushrooms and bring to simmer. Once the onion and garlic are soft add the venison and tomato puree to this and cook for 3 min, stirring. Next add the red wine and allow this to reduce by half. Now add any flour you have left over, stir well. Add the mushroom flavoured stock again stirring well. Finally season and add the thyme sprigs then allow to cook out on a low simmer for at least 90 min or until meat is cooked. Wash the pearl barley in some cold water then place into a pan with 300ml of cold water, bring to boil and cook for 30 min. Then drain and refresh in cold water ready to add to stew once it is cooked. Melt 20g of butter and then dip the bread into it on both sides. Place the dipped bread on a baking tray and put in the oven at 190C to go golden brown. Once cooked place on a paper towel to drain any excess butter. If the sauce is a little loose, once the meat is tender and cooked, then remove the meat carefully and place in a covered bowl. Now allow the sauce to reduce until it just coats the back of a spoon then add the precooked pearl barley bring the sauce back to boil (if the sauce is just fine then remove the meat and add the pearl barley straight away). Once the sauce has come back to the boil turn the heat down to a simmer and then add the remaining butter in knobs stirring them in to give a rich gloss to the sauce. 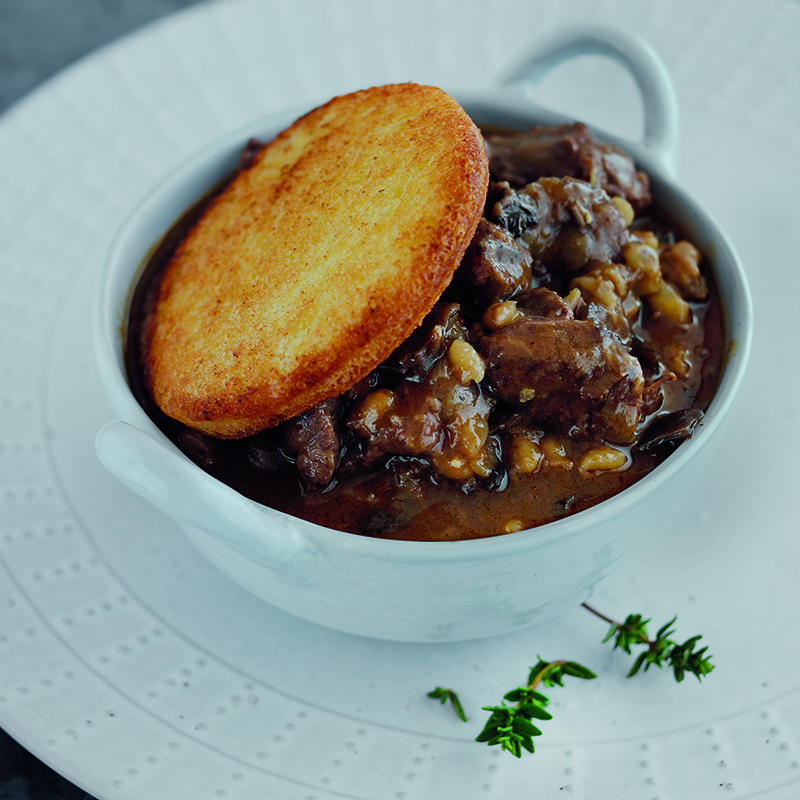 Finally add the meat stirring in carefully serve on top of the bread croute or in a small dish with the croute on top. Enter your email address into the box provided to receive our newsletter.